For the first time, you can now get all three novels in Stephen Bly’s Horse Dreams Series together in one trilogy book. In the first novel of this series, Memories of a Dirt Road, we meet Develyn Worrell. Develyn, or Devvy for short, is a fifth-grade schoolteacher from southern Indiana who is broken-hearted about her husband's death and her daughter's decision not to come home for the summer. To clear her mind, Devvy decides to find a little dirt road town in Wyoming where she vacationed as a child. She fondly remembers the quaintness of the small town, the beautiful sunsets, and an remarkable Roan horse that has captivated her dreams ever since. Desperately wanting to experience that peace and tranquility again, Devvy embarks on a journey to find the town. When she arrives, she purchases her very own Roan mare, rents a little cabin with an incredible sunset view, and watches as God brings three very important men into her life. 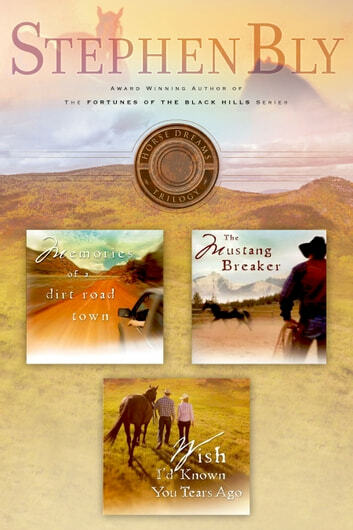 In the second part of the Horse Dreams Series trilogy, The Mustang Breaker, heavy-hearted Develyn Worrell’s mood is changing as she begins to escape the worries of her past and enjoy the equine charms of her picture-perfect small Wyoming town. It is there that the Lord’s leading is beginning to become clear, even as cowboy romances and the relationship with her grown daughter get more complicated. In the third and final installment of the Horse Dreams trilogy, soul-searching Develyn Worrell has finally found her groove. Ready to savor the end of summer in small town Wyoming, she settles in to enjoy “end of summer” peace and contentment. That is, until her daughter pays a visit, an eclectic friend plans to marry, a suspicious stranger enters the picture, and a dear mentor suffers a heart attack. Just as she begins to feel as if the world is closing in on her once again, the steady friendship of Cooper Tallon comes to her rescue. He may lack the charm and flash of other cowboys, but he always seems to have just what Develyn's heart needs. As her relationship with Cooper blooms and her faith and trust in the Lord grows, she looks forward to the unwritten chapters of her life.